Spring, for me, is when food feels most profound. The produce that emerges at this time of year is vibrant and bright, a burst of freshness, perfectly reflective of the emotional state that we find ourselves in after a cold, rainy and/or snowy winter. The idea of life emerging from the earth is pronounced after a winter of root vegetables and rock-hard squash and cellared apples and hearty greens that withstood the chill. It’s not such a stretch of the imagination that those could be pulled from the earth, but the produce of springtime? It seems miraculous. Here, now, are these most delicate leaves and shoots, berries on their heels, herbs that demand careful handling, life that reminds you in the palest green of its newness. Recently, a friend who is in the midst of an excruciatingly difficult time asked a question about how, actually, one trusts—in this context, in God, but you can apply the concept regardless of what sort of divine being you do or don’t believe in. Cliches aside, what does that really look like? What do you do? The question stopped me in my tracks. It is an essential question, one that I, too, have asked in the darkest seasons of my life. And when others suffer, when hope feels slim, when the world looks more fierce than kind, I find myself asking it again—because of course I haven’t found an easy answer. While catchphrases might be tempting in brighter days, when we are actually in the thick of it, we are very aware that whatever the answers might be, they surely are not simple. As for me, I have touch points and tools and routines. I have people and words I can lean on. These things resemble an answer. But especially in the bleakest of times, I think that trust, in its simplest form, looks like waking up each day and getting out of bed and carrying on anyway. It is as hard and as easy as this. Spring reminds me that hope is not in vain. An answer, some sort of resolution—whether or not it’s the one I hoped for—will always come. Life emerges. The cycle continues. Winter might last for a really, really, really long time, but spring always comes. Though we have no such thing as snow here in my part of Northern California, springtime has been slow to arrive this year, and I grew weary of March’s incessant rain and the draftiness of my apartment. Most of the springtime produce is yet to come, hiding in the ground since it’s been colder here than usual, but when asparagus appeared at the market a couple weeks back, I knew spring was on the horizon. Here are four ways to prepare it as we wait for the sun, springtime, Sunday morning. Wishing you hope this Easter and springtime. Sliced or shaved thin, raw asparagus is a delicious thing. Trim or snap off the woody ends, then use a y-peeler to make ribbons (I find this easiest if I put the asparagus along the edge of the cutting board so there’s some wiggle room between the peeler and the countertop on one side), or slice in thin coins (1/4 inch thick at most). Add raw asparagus to salads, put it on toast rubbed with garlic and topped with ricotta or goat cheese, or throw it on a pizza before baking. Or, serve it as a little salad on its own, tossed with a dressing made of olive oil, lemon juice or red wine vinegar, a dab of mustard, salt and pepper. Feta and/or toasted pepitas would be a nice addition here, too. Often overlooked, blanching or boiling vegetables can yield a lovely result, particularly when the subject is at its freshest. Bring salted water to a boil in a large pot (or a sauté pan deep enough to hold a couple inches of water). Trim the ends of the asparagus, and either keep whole (the prettiest presentation) or slice on a bias into 1- or 2-inch pieces. Place the asparagus in the boiling water. Cook for just 1 to 3 minutes, until bright green, then drain in a colander. Finish simply with good olive oil, a squeeze of lemon, flaky salt and freshly cracked pepper. A few soft herbs are an excellent addition (pictured). Or, take it a step further: chop a big handful of fresh herbs such as parsley, mint and/or chives. Place in a small bowl and pour in olive oil to cover. Add the zest and juice of a lemon and a pinch each of salt and pepper. Optional additions include chopped capers, chopped toasted almonds or pistachios and/or finely grated Parmesan. Spoon this mixture over the asparagus for an elegant, brightly flavored dish. Classic but delicious. Trim the ends of the asparagus and either keep whole (a little unwieldy but totally doable) or slice into 1- or 2-inch pieces. Warm olive oil or butter in a large sauté pan. Add the asparagus and sauté for a few minutes, anywhere from 3 to 10 depending on your preference. Toss in minced garlic and/or red pepper flakes for the last minute of cooking if you’d like. A squeeze of lemon is a nice way to finish; salt and pepper are essential. This is lovely alongside scrambled eggs. Could a side dish be any easier?! Heat the oven to 400 degrees F. Toss trimmed whole or sliced asparagus with olive oil, salt, and pepper, then spread evenly on a baking sheet. Roast for about 15 minutes, until the asparagus is tender and lightly browned or burnished, to your preference. 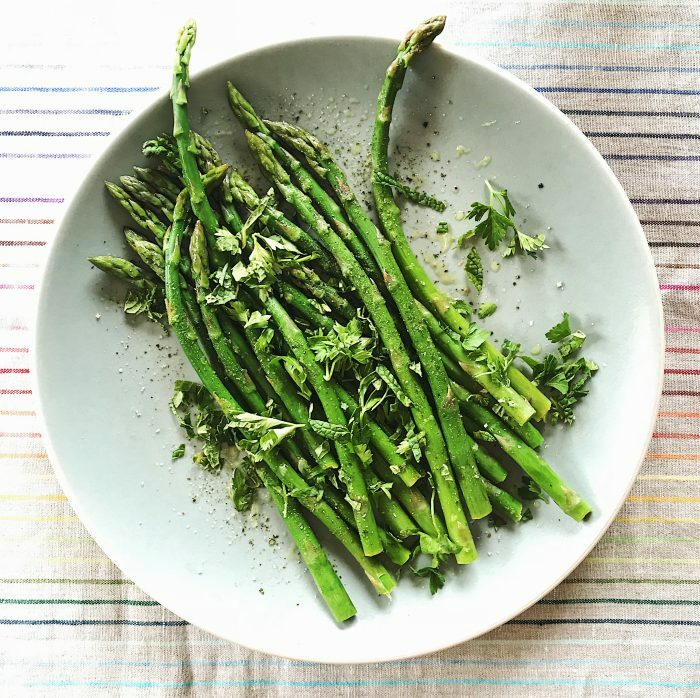 You could also add red pepper flakes, garlic (though this is slightly risky as it can burn at high heat), lemon zest or Parmesan before baking, or top the roasted asparagus with breadcrumbs and/or Parmesan, Feta or goat cheese. Beautiful photo, recipe ideas and sentiments! We are enjoying some of your California asparagus today, and waiting, in hope, for it to appear in Michigan several weeks from now. Thanks for this Stacy! I don’t know why because it totally makes sense, but I have never thought of eating asparagus raw. ;) Loved all your ideas…some I have done before and some I have not–new things for me to try!